In partnership with the Instituto Nacional de Recursos Hidráulicos (INDRHI ), and in partcular the co-located and INDRHI-supported UNESCO centre, Centro para la Gestión Sostenible de los Recursos Hídricos en los Estados Insulares del Caribe (CEHICA ), ICIWaRM helped investigate rising lake levels in Lake Enriquillo in the Western Dominican Republic. 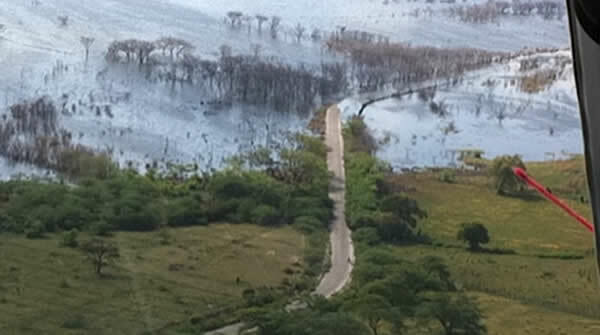 The purpose of the project was to assist the Dominican government in assessing the likely causes of the lake level rises and, looking to the future, determine the best steps to strengthen the country’s capacity to adapt to and mitigate the rise. The rising waters are flooding agricultural lands and roads, water supply intakes, and houses. 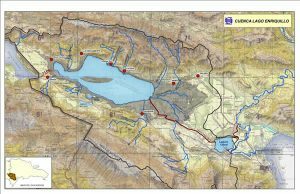 An ICIWaRM-led, interagency study team from the Corps of Engineers, NOAA, and the University of Arizona visited the lake during September 2011 to conduct field investigations with regards to potential sources of increased inflow to Lake Enriquillo. Historically, lake levels have been given to a natural cycle of rising and falling, and more recently, from the middle of the 20th century through 2005, the levels were both stable and relatively low. However, lake levels began rising in the middle of the last decade, and by some estimates has increased its surface area by 50% since 2003. Based on a semiquantitative but methodical assessment of lake inflows, the study team showed that many of the hypothesized sources of the rise are unlikely to be significant. However, uncontrolled flows from the nearby Yaque del Sur river are on the correct order of magnitude to account for much of lake level rise. Recent storms caused damage to control structures, allowing for the uncontrolled flow into the lake, and in the judgment of the study team, lake levels may continue to rise absent the reestablishment of functional control measures. Moving forward, there appear to be opportunities to enhance IWRM planning in the basin. Decision processes will need to be established to address questions of preferred water control methods and lake level thresholds, for example, and political leadership will be required to implement the desired solutions. ICIWaRM and INDRHI are exploring the potential for future collaboration in this region. The report is available here. For more information, please contact Will Logan.